Stay far, far away from synthetic pot products. It’s a sentence that just about sums up 2018 so far: Illinois is dealing with an outbreak of synthetic weed that makes its users bleed from their eyes and ears. 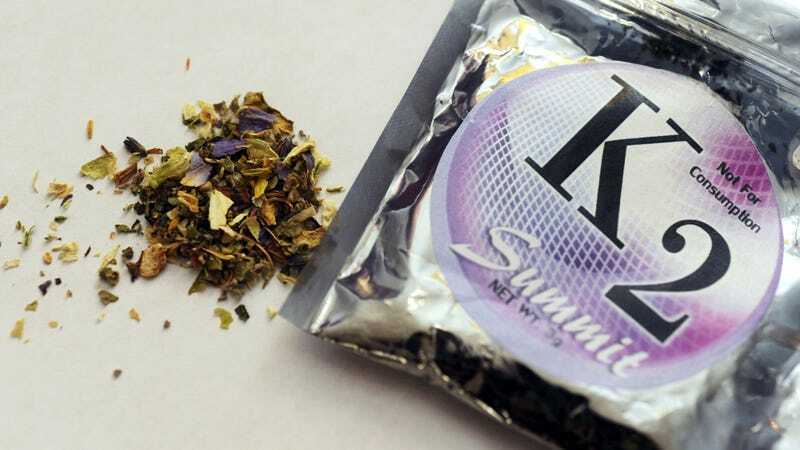 On Thursday, the Illinois Department of Public Health (IDPH) reported that since March 7, at least 22 people have developed severe bleeding soon after taking synthetic pot products. The bleeding has not only occurred from their eyes and ears, but from their noses and gums as well. Patients have also vomited up and urinated blood, experienced large, unexplainable bruises, and had extremely heavy menstrual bleeding. There’s been no single product tied to all the cases, though the majority of patients recalled buying their products from dealers, stores, and friends around the Chicago area. As of yet, there have been no reported deaths. Manufacturers of these products either spray chemicals believed to mimic the high of conventional marijuana onto smokable herbs or sell the mixtures in a liquid form that can be vaped. The products, packaged as Spice, K2, or a hundred other names, contain an unregulated and ever-changing cocktail of chemicals that can lead to widely different experiences for users. Leaving aside the Ebola-like trips from hell seen with these recent cases, users have reported psychotic effects, including extreme anxiety, paranoia, and hallucinations, according to the National Institute on Drug Abuse. Others have died. With the federal and state governments scrambling to ban the ingredients commonly found in these products, manufacturers have continuously formulated new, untested combinations of cannabinoids, a 2015 report by the Centers for Disease Control and Prevention noted. At this point, though, there’s still no concrete answer as to how exactly the pot products are causing the bleeding. An earlier report by the IDPH speculated that something in them seems to behave like a “superwarfarin”—referencing the commonly used blood thinner—by quickly blocking the effects of vitamin K in the body. What’s scary is that these sorts of blood thinners take a long time to flush out of the system, meaning the bleeding episodes will likely last a while. Already, the IDPH reports, some patients have been readmitted to a hospital after suffering a relapse. The IDPH has not immediately responded to a request for comment from Gizmodo. In response to the outbreak, the agency has warned coroners, schools, and hospitals to remain on the lookout for more cases. It has also advised pharmacies to stock up on their supplies of vitamin K, which potentially could be used to treat a patient suffering from excess bleeding. People who have purchased these products in the past month should avoid using them, the IDPH says, and any users who experience symptoms of severe bleeding or unexplained bruising should immediately have someone take them to the hospital or call 911.